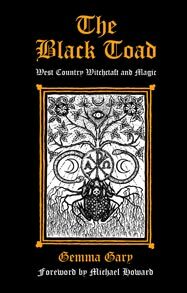 The Black Toad explores potent examples of the folk-ceremonial magical practices and witchcraft of the south-west of England; dealing especially with Devon and the author’s homeland of Cornwall. Within the West Country, the popular belief in witchcraft and its attendant charms, magical practices and traditions continued to be observed and survived long after such ways had faded in most other parts of the British Isles. Described within The Black Toad is a collection of some of the fascinating magical practices and lore of the West Country’s cunning folk and early modern witches; ways that have survived and evolved within the rarefied Craft of the area’s modern day witchcraft practitioners of the old persuasion. As this book affirms, these ways of the Old Craft and Cunning Arte include a belief in and working relationship with the spirit forces of the land, the Faerie, animal and plant lore, as well as the magical use of Psalms to cure or curse, the invocation of Christ and the power of the Holy Trinity. This entry was posted on May 21, 2012 at 10:31 pm and is filed under Uncategorized. You can follow any responses to this entry through the RSS 2.0 feed. You can leave a response, or trackback from your own site.